Mish's Global Economic Trend Analysis: Reflections on the "Sure Trade" of 2014; Yield Curve Inversion Possible? Five "Sure Things" for 2015? Reflections on the "Sure Trade" of 2014; Yield Curve Inversion Possible? Five "Sure Things" for 2015? 100% of economists predicted yields on the long end of the US treasury curve would rise in 2014. Instead, they dropped all year. And just two weeks into January of 2015, the 30-year long bond made a new intraday record low of 2.39%, breaking the previous low of 2.44% on July 26, 2012. In contrast to economist predictions, the long end of the yield curve fell 1.49 percentage points (149 basis points). That's the equivalent of 6 quarter point cuts, not hikes. Meanwhile, yields rose slightly on 2-year and 3-year treasuries. Buying the extreme long end of the curve while shorting 2- and 3-year treasuries would have gained both directions especially if one did the latter on the few small yield rallies that did take place. In addition to the rally on the long end of the curve, every possible spread between 2-year and 30-year treasuries all tightened! If the economy was getting stronger, yields on the long end of the curve would be rising and spreads would be widening as well. 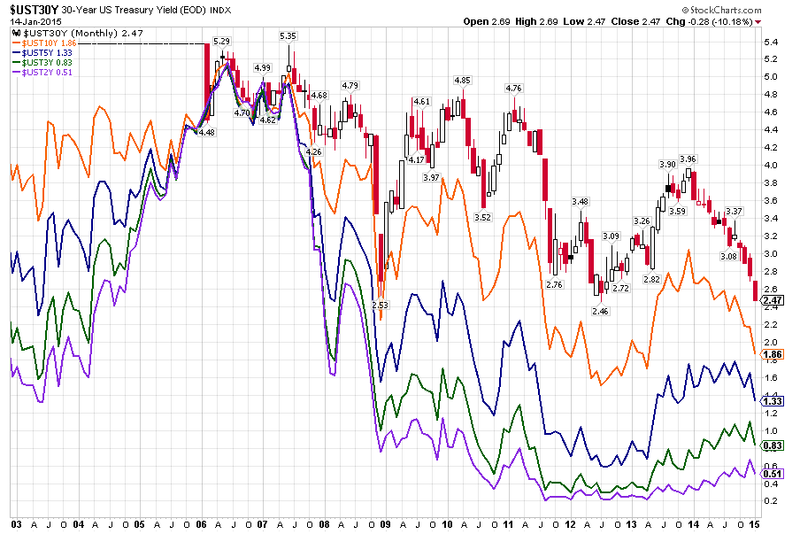 The bond market does not believe the recovery will strengthen and neither do I. In fact, I suggest we are on the cusp of recession (something I have admittedly been wrong about before). With the Fed still holding the short end of the curve near zero, collapsing yields on the long end coupled with tightening spreads to the downside is about as big a recession indicator as one could expect. The typical sign of recession, an inverted yield curve with 3-month treasuries yielding more than 30-year treasuries (we saw in 2000 and again in 2006-2007) is not going to happen in the absence of rate hikes. Yet, looking at actual spreads, I do see room for possible inversions on some parts of the curve. 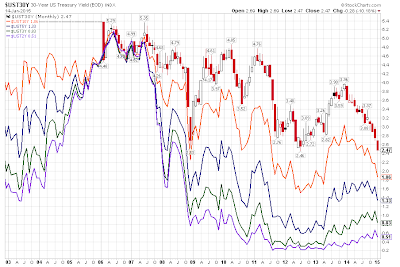 For example the 30yr-10Yr spread is only 61 basis points (narrowing from 92 basis points). The 5Yr-3Yr spread is 50 basis points (about half of what it was at the beginning of 2014). If the Fed does pull off a round or two of tightening, we could see portions of the curve invert, and I would actually expect that. I have not seen anyone else even discuss the possibility. Treasury yields show traders are pricing in deflation for the next two years. The difference between yields on two-year notes and non-indexed U.S. government debt of comparable maturity, an indication of consumer prices called the break-even rate, fell to negative 0.13 percentage points, down from 1.96 percentage points in March 2014. Interest-rate derivatives predict the Fed’s policy rate will rise to about 0.43 percent by the end of December, about a third of the 1.125 percent rate central bank officials predicted in December, according to the median of their quarterly forecasts. The worldwide bond rally sent the effective yield on Bank of America’s global index of sovereign debt to a record-low 1.2 percent yesterday. Ten-year debt yields fell to 1.51 percent in the U.K., 0.65 percent in France and 0.26 percent in Japan. There’s a 67 percent chance the Fed will raise its benchmark rate to at least 0.5 percent by December. At the end of last year, wagers were focused on a September start. Five Sure Things for 2015? I strongly suspect one or more allegedly "sure things" for 2015 will not happen. 100% of those surveyed predict S&P will rise. See Ding! Ding! Ding! Pimco Plans a Push Into Stocks With 7 New Equity Strategies; No Forecaster Predicts S&P Decline in 2015. 100% predict yields on the long-end will rise significantly. 67% think the Fed will hike at least 50 basis points by December. Most think the dollar will rally further. I take the other side of those bets, adding that if the Fed does manage to pull off a couple hikes, they will quickly reverse in 2016 as the entire global economy sinks. Retail Sales: Economists Still Upbeat: Retail Sales Drop Seen as "Blip"
Oil: What's Behind the Plunge in Oil? Winners and Losers? Boon to Spending or Recessionary?